When I’m in the mood for a lighthearted and witty read, I know I can always count on author Georgette Heyer, the queen of Regency romances, to deliver! 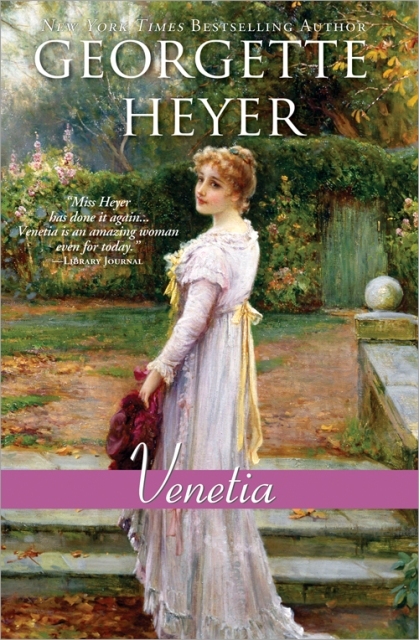 Heyer is quite fantastic at writing charming heroines and Venetia Lanyon is no exception. She is the eldest of three and sole caretaker of the family home at Undershaw and of her youngest brother, Aubrey. She has never traveled, can count the number of people she’s met on two hands, and is doggedly pursued by two local boys who desperately want her hand in marriage. When she meets Lord Dameral one day while out for a walk (and quite a first meeting it was! ), she can’t help but wonder who the real man is behind the scandalous reputation. As circumstances force them together their friendship grows, despite the warning’s that Venetia stay clear of the infamous rake. What ensues is lovely story of following one’s own heart and finding true love. And though I adored Venetia and Lord Dameral, who I really loved the most was Aubrey...he seriously had me laughing out loud at times! I’ve heard so many people raving about Venetia recently, and now I can see what they were talking about! Venetia is now ranked among my favorite Heyer reads and if you’re a fan too, this is one you won’t want to miss! I was delighted to see your review of VENETIA and I'm so glad you enjoyed this one. It's one of my all time favorite romances. I'm a huge GH fan anyway, but what I feel stands out about this particular book is the sizzling sexual tension between the h/h that you don't usually find to this degree in this author's work. Although there are no "love scenes" per se, the chemisty between Venetia and Damerel is incredibly palpable and implies a great deal off stage/page! I'm currently reading A Civil Contract. What I love about Heyer is her secondary characters. So fleshed out and hilarious! Great review, I'll definitely pick up this one. Venetia is one of my favorite Heyers! I love the feisty characters and twists and turns in the story. Georgette Heyer's books have long been a favorite of mine. I'm currently reading "April Lady" and loving it! I have to admit that I have to totally concentrate so as to understand the wording which is quite different from some of our more "modern" historical romance authors. I'm so glad to see her works being resurrected so all romance readers can enjoy her works.